Don’t mow your grass too short! Keeping your grass at a longer level, around two inches, will help to retain the moisture in your soil, which will require less watering on your end! Cutting your grass too short also leaves it vulnerable to malnourishment and disease. Water thoroughly, but only once every three days or so. This will encourage the roots of your grass to grow deeply. It can also prepare your grass for the hot, dry days ahead. A great way to ensure that you stick to your watering schedule is by turning to us for sprinkler system installation. Refer to our blog to learn about the advantages of getting an automatic sprinkler system installed. Leave your grass clippings in your yard. 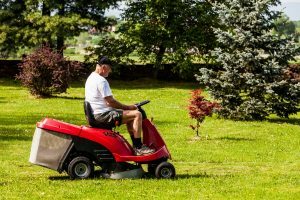 We know that they can be annoying, but the grass clipping can provide much needed nutrients for your lawn. Just sweep them off of your walkways and patio. In an attempt to have the most illustrious lawn on the block, people often make the mistake of over-fertilizing. When you use fertilizer correctly, it can make your yard flourish and prevent weeds from growing, but over-fertilizing can have disastrous results.